In the United States, you will hear madmen insist that: 58 dead and 500 injured in Las Vegas are the price of freedom; 49 dead and 58 wounded in Orlando, Florida, are the price of freedom; 27 dead and 2 injured in Newtown, Connecticut, are the price of freedom. And so it goes. This truly is insanity. We can try to deal with that small percentage of the population who collect or own guns for hunting, target shooting or security, but to claim as a constitutional right the possession of firearms intended for nothing less than brutal, gruesome warfare strains credulity. These are killing machines with no purpose other than to maim and destroy. Of course, we’ve said this time and again and will doubtless say it again because the foolish cycle remains unchanging. Every time someone unleashes gun violence and takes multiple victims, we begin with adamant, genuine grief and a collective wringing of hands. Then we are told that the immediate aftermath is not the time to bring politics into a time of sorrow, and then that, yes, maybe we will look into the license to kill we permit with our lax gun laws. Then the flowers will fade, the candles will gutter, the memorials will be over and nothing will be done. What was different this time was that just a couple of days after the Las Vegas deaths, for once the NRA seemed in favor of new gun laws, in this case forbidding the sale of the bump stocks that killer Stephen Paddock used to turn his semiautomatic rifles into automatic weapons that could spray the concert area below him with hundreds of bullets. 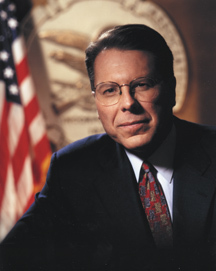 Wayne LaPierre, executive vice president of the National Rifle Association. So don’t be fooled by their rhetorical camouflage. In truth, the NRA still wants to steer clear of any open debate in Congress that conceivably could change minds and even lead to other new gun control rules already widely favored by the public — like a renewal of the ban on assault rifles, universal background checks and a federal data base tracking gun sales. That the acts of mass murderers are evil is undeniable. The problem is that if you insist that civilization cannot avoid the generation of evil acts — that the force of evil is out of the control of mere mortals — you are throwing up your hands and shirking responsibility for taking action. It’s a stinking cop out. We must continue to try. Yet given the nature of evil, why bother, LaPierre suggests. He knows the answer. More guns. But only for “the good guys,” of course. Madness. “Political power flows from the barrel of a gun.” Do we want only the state, with its police and military, to have an unchallenged ability to kill? It is sad that in a country of over 300 million, you cannot get enough people honest and fair, to represent you. My problem with this whole debate over private gun ownership, is that with each tragic event comes down the hammer upon our civil liberties. My reluctance of late with the conversation America is having with gun rights, is will gun control be a method to be used to decrease such terrible happenings, as what happened in Vegas, or will new gun control laws be used to just take away from the American citizen more of our inalienable rights? The other problem, which is in many ways more of the problem, is will the final conclusion of the investigation of the Las Vegas shooting be convincing enough for us all to believe beyond a doubt? Let’s face it, no one from the average guy on Main Street to Kim Jung un believes a word of what comes out of the noise machine in Washington. Credibility is nowhere to be found around the DC Beltway, and that’s the most important value that is loss when our leaders constantly lie to us. Truth in our nation’s capital is what’s a commodity, where lying is always on sale everyday. So maybe before we start hatching away more of our freedoms and rights, we should start hearing the truth. I wonder what the odds are in Vegas on the truth ever being told by our Lying Government? the first sign of the ignorance to follow begins with the title; what evil do guns do Mike? you mean like Madeleine Albright who stated that the slaughter of 500k + Iraqis was “worth it”? why aren’t you including the biggest mass-murders on planet earth in your anti-constitutional hit-piece; governments? by the way, i wonder if you’re aware of the fact that, while gun ownership increases in the U.S., crime decreases??? check with the FBI stats Mike – kind of makes every one of your points moot, no? ah, yes, i see your point … lord knows that the bad guys will obey the laws if we take the guns away from the good guys, right? I believe I can deduce two things here. One is that you slept through HS English. The other is that you avoid reading news stories. The NRA went to its pet agency in an attempt to avoid the potential Congressional debate AND potential legislation. That’s obvious to anybody except the gun nuts. The only gun nut here is you Zach, it’s completely obvious you are nuts about them. Please keep insulting people as it’s really having a strong and positive effect. You have no wish or desire to make Americans safer, all you want to do it take their right’s because it YOUR believe firearms are just for nutters. Your approach only further divides people on this question. If you had any desire other than pot stirring you would be advocating for measures which will actually make Americans safer and not just going around insulting others with different viewpoints. Does your shilling pay well? It’s hard to believe you’ve actually been reading my posts. Or is this the standard NRA reply to anybody who wants regulation? Spoken like a true gun nut Zach, Bravo. One of us isn’t reading the other that’s for sure Zach. If it was a standard NRA response I’m positive you would have heard it numerous times and not have had to make it up out of thin air as some excuse for a cogent argument. As with most wedge issues the ones who know the least are squealing the loudest. Please…… do carry on. While gun control and new laws are well and good it ignores data and a mountain of contributing factors. When friends from other countries point to their gun laws and preach how the usa needs to wake up….do your countries have a 46 year war on drugs creating an ocean of gang related drug rings, cartel operations causing citizens of other countries to flee north to the usa, deaths, overdoses and miseducation? Is your county the worlds police force (im anti war and the war machine but its a contributing factor)? did your country kick out a world power and create the greatest vision of freedom and liberty(how far we have fallen, yet how far too go?) because of an armed public? Do you deal with the threat of a militarized police force near your doorstep with a government 20 trillion in debt? Questions that are relevant….oh yeah, that bumper stock was made illegal but another company tweaked the design and released abunch….so much for those laws you mentioned. Zachary Smith – Mike Adams’ video was well done. Using the information that the police have released to the public so far, he raises some very good questions, then offers his assistance. I’d say they should take him up on his offer. “We know we were lied to about the JFK and RFK assassinations, the Martin Luther King assassination, the Gulf of Tonkin, the Israeli attack on the USS Liberty, Saddam Hussein’s “weapons of mass destruction,” Assad’s use of chemical weapons, Russian invasion of Ukraine, Gaddafi, Yemen, Somalia, Obama’s overthrow of the Honduras government, and Maduro in Venezuela still targeted for overthrow along with the governments of Ecuador and Bolivia. The lies we know about are voluminous. Wow, that’s a whole lot of lying going on. And the people should hand over their guns to that? Yeah, right. I’ve found two articles. One is by Paul Craig Roberts. The other is by “a physics-literate individual” who started by congratulating Mr. Mike Adams for his “excellent” work with its ‘unequivocal proof’. From there he moves on to examining and expanding Mr. Robert’s beliefs. So I asked myself, how is it possible to have credible acoustic evidence that several thousand rounds were fired from multiple locations, while at the same time no one actually got shot? One might well ask why the perpetrators of this deception would set up such a hoax instead of just shooting a bunch of people as a “false flag” attack. After all, they didn’t hesitate to kill a few thousand people on 9/11/2001. Why change their game-plan (assuming it’s the same gang – or their buddies)? I can only speculate about this; but I’m guessing that the killing of several thousand innocent victims on 9/11 weighed heavily on the consciences of the hundreds of people who were involved – making control of the aftermath by killing and intimidating potential whistle-blowers an expensive and stressful undertaking. On the other hand, the crisis actors involved in Orlando, Boston, Sandy Hook, and Las Vegas know that no one was killed – so their burden of guilt is far less than that of the people involved in 9/11. These mass killings didn’t happen. It’s all some kind of scheme to take away the guns of the heroic patriots who follow in the footsteps of the Founding Fathers. because” governing” is so ‘hard” and” complicated”. Thanks . First part djt, second part Paul Ryan. I guess we should all give up, because we cannot control ourselves. There are some common sense ways to go about solving our issues, but I do not see with it these guys in charge. Next week , or next month, the same thing is going to happen. We can talk all night and day, there will be another mass shooting. I am numb, in fact I am almost expecting the violent act in my neighborhood, where we always say, “I never ever imagined it could happen here. We are such a tight-knit community. I cannot believe this.” And then, the “Thoughts and Prayers”. are with you fill in the blank. What do you think is going to happen with so many weapons, people want to use them. If I happen to be the victim, well, too bad. is not that sad? What is wrong with this country? Zachary Smith – are you an expert? In what? Firearms, ballistics, trajectories, acoustics, physics, psychology? “It is quite clear to me that the FBI and police already know if there were other shooters.” Really? Why, because there’s never any politics involved? Because we should take their word for it? Never any cover-ups, false flags, set-ups, because they can’t tell a lie? Mike Adams was comparing apples with apples. He said in the video that if the FBI or the police would like his help, he would be happy to assist them. If at that time he learned otherwise, that other weapons were used, he could do the calculations for them. The police have already said in multiple reports I’ve read online that Stephen Paddock had numerous guns, but that he DID use AR-15’s with bump stock and .223 caliber bullets. That, no doubt, was why Mr. Adams used those specifications. Mr. Adams detected two weapons that were firing SIMULTANEOUSLY. Hence, his suspicion there were two shooters. “This Adams character didn’t – at least before I stopped wasting my time – speak of the crime scene itself.” Yes, he certainly did. Had you continued on, you would have heard him speak of spent shell casings and also following the bullet trail. “I examined the Mike Adams video and concluded he is 1) a smartass and 2) probably full of ****.” You didn’t examine the Mike Adams video, you did nothing of the sort and, because of that, you couldn’t have come to any conclusion. I just think he said what you didn’t want to hear. My “smartass” detector is “pointing straight back along the firing vector”. I examined the Mike Adams video and concluded he is 1) a smartass and 2) probably full of ****. I say “probably” because it is barely possible a second shooter could have existed if he had taken certain precautions. Adams assumes the shooter used only .223 Remington rounds. How does he know that? My searches turned up no such information. Were all the rifles chambered for this round? And what WERE all the rifles? I’ve never seen a list. Has he? This Adams character didn’t – at least before I stopped wasting my time – speak of the crime scene itself. If there were shell casings back at the shooting point(s) there will also be be the physical bullets and their impact points down at the victim end of it all. It is quite clear to me that the FBI and police already know if there were other shooters. Does this Adams dummy forget that when bullets strike a surface at an angle, their ricochet on the concrete or steel or glass leaves a mark pointing straight back along the firing vector? Also, some few will strike solidly against a surface, possibly even becoming embedded there, and that’s another sign pointing back to the weapon. Paul Craig Roberts posted a video re the possibility of two shooters in Las Vegas, one at Mandalay Bay and another much closer. This fellow uses acoustics to pinpoint what he thinks is a second shooter. Check it out. Everyone has good and bad in them. If you think evil just lurks out there, take a good look in the mirror. We aren’t far off the trees. The actual fact is they don’t want to fix any of this, it’s too powerful as a wedge issue. The fixes are so simple and would have immediate effect on actual safety while not evoking 2nd amendment rights, that it becomes quite obvious they prefer this as a wedge issue. Firearms are still just pieces of metal. Humans are the issue, not an inanimate object. Because one person misuses them does not mean you get rid of the right to bear arms. End of story. Because one person misuses them does not mean you get rid of the right to bear arms. End of story. The NRA must be training people to frame it this way. The part which was REALLY important to slip into that was “get rid of the right to bear arms”. Instead J&J pulled every single Tylenol product from the market. Then it ended the sale of the pain killer in capsules. Safety seals galore appeared. This sort of thing could be done with the guns. Not chant some formulistic Bull **** like you’re doing here. You’re funny…Let me guess…New Jersey? Boston? Your better yet, San Fran. You are so predictable. Sad. It’s true that firearms do not create deadly violence: they simply allow it to be carried out with maximum efficiency. 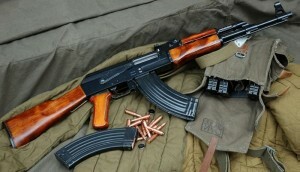 A firearm is a tool whose sole purpose is to take life. In less time than it takes to think – literally – a lead projectile traveling several thousand feet per second will inflict an irreparable, lethal wound. It would take a special kind of insanity, perseverance, and physical strength to wreak the same amount of damage to human tissue with a knife, a proverbial blunt instrument, or even a pointy stick. It is also true that every culture that believes human nature can be perfected or even improved becomes totalitarian in the pursuit of this impossible goal. You cannot eliminate motive, but you can reduce means and opportunity. In Stephen Paddock’s trunk they found a cache of tannerite and ammonium nitrate. That’s bomb-making material. Did he buy it? Was it planted? We’re never going to know the truth. We wanted to take out Saddam Hussein, so we planted Weapons of Mass Destruction in people’s minds. Our own government. Evil. We wanted to take out Gaddafi, so we planted lies in people’s minds. Evil. Ditto with Assad, who we painted as a terrible dictator and user of chemical weapons in order to take him out and get what we wanted. Evil. Maybe Stephen Paddock did this (IF he did this at all) because he was merely reflecting the evil at the top. Or maybe the evil at the top used and set up Stephen Paddock to get what they wanted – gun control. Hey, if you doubt me, read the above again. I believe it was under Saint Obama that bump stocks were allowed. Evil. Russiagate lies – evil. When your own government is evil, you’d be a damn fool to give up your guns. But go ahead, turn your’s over. Just don’t be asking your neighbor for protection when things go south. How exactly did the strict French gun laws help to prevent the massacre at Bataclan? The NRA has a subdued response because the deep state is using guns as a scapegoat for whatever actually happened in Vegas, not because some folks died. Guns and their associated paraphernalia are a large part of the American economy and can’t just be switched off. Gun production is all part of the war machine which is probably half the entire US economy and if halted would result in the bankruptcy of America. Over here in the UK we have no guns as such and any killings by guns we have are very rare. This is not because we are in some way altruistic about the prohibition of gun ownership, its just that we have never had guns in the way the US has. Some parts of Africa are awash with guns and death by shooting there is common. Guns to America are what spaghetti is to the Italians, it a cultural thing. While some may still be “evil” and against such and such, it CAN and HAS been greatly diminished. I’ve come to a tentative conclusion that although a lot of DC legislators are afraid of the NRA, many more are True Believers. They support unlimited numbers and types of guns because that’s the way it ought to be. If you hear one of them describing the Hearing Protection Act of 2017 as a “health issue”, that man or woman is a genuine nut.